Request a room for an event. Schedule a room for a course with a course number. Request equipment or furniture for a course or event. Request special event containers for events serving food and beverage. Schedule the video conference studio in the Health Sciences complex. 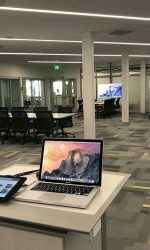 Learn how to use the installed technology in a Health Sciences general assignment classroom or event space, or request that an operator attend a course or event. Download the Active Learning Classroom (ALC) Guides. Schedule course casting for a course or event. Key checkout for classrooms, projection booths, podiums and equipment.